Having grown up with thick, curly hair in the 80's, I may not have needed as much Aqua Net as the other girls to get big hair, but it was frustrating trying to find products that calmed my frizz and held my curls. There just wasn't anything available in the drugstore that was made for curly hair. Consequently, I am always on the hunt for that Holy Grail curly hair product that gives me soft, defined curls - with no crunch, and no frizz. I may have found it in Royal Locks Pro Curl Cream! The woman behind Royal Locks is someone who shares my story - a curly haired girl, frustrated with the lack of products that work to make our curls look and feel their best. Made with dimethicone for that slip, as well as keeping frizz out, and Argan Oil for nourishing the hair, my curls love this creme. The curl creme actually looks like a creme-gel hybrid - sheer white, with a slippery consistency that isn't tacky or sticky. A few pumps from the dispenser is enough to run through all my hair. If you have curly hair, you know that you have to have a feel for how much product to put in your hair. Too little, and hello, Frizz! Too much, and it's grease-city, with lank locks that lack body. So far, I've had no trouble feeling when my hair has just the right amount of this curl creme. The creme does have a subtle fragrance, like a perfume, but it doesn't bother me, and it's not strong or lingering. In this case, I think pictures are worth a thousand words. My hair has several different textures in it - from just wavy near the crown, to tight ringlets near the nape of my neck. This cream works for all of them. A little stamping, over Revlon Sequin, inspired by the Royal Locks logo. 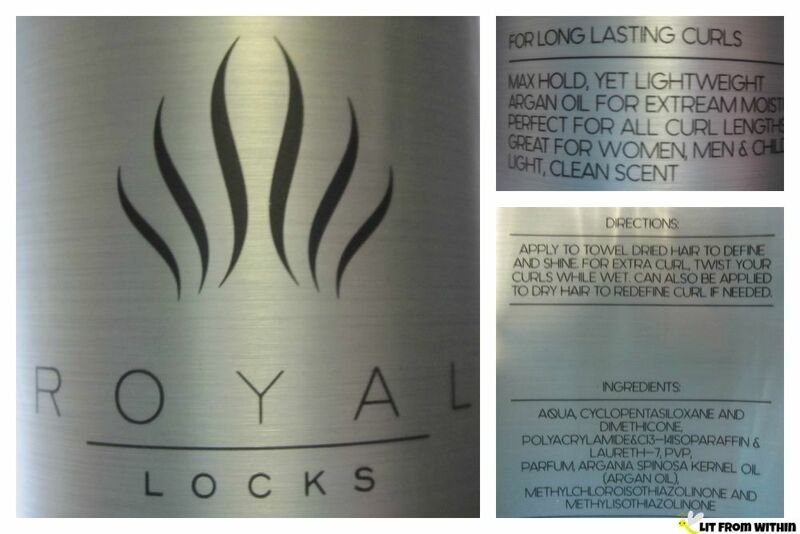 I can't wait to see what products Royal Locks comes out with next. For more information, or to purchase, you can find Royal Locks on her website, or on Amazon, where this Pro Curl Cream retails for $28.